In Bintulu one can shop for fresh fishes in the evening or at night time at many fish stalls that are set up by late afternoon at the Night Market situated at the heart of Bintulu town. 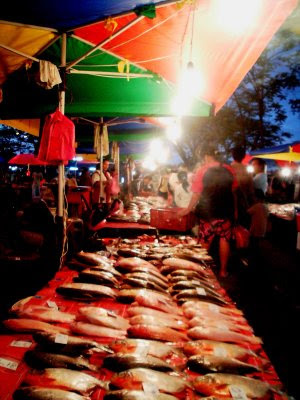 A section of the market is devoted to fresh fishes that are harvested from inland fishery ponds operated mainly by the Ibans at the town's outskirts. Two species that are always available are the Patin and Red Tilapia.